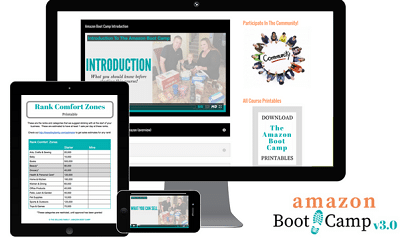 I highlighted Jessica’s initial version of the Amazon Boot Camp training program on the site, when it first came out back in 2014. In response to that original post, I received some questions from you guys in regards to the course. I reached out to Jessica directly to get some answers to those questions and also to get some further details on what the latest version 3.0, fully updated for 2017, contains. The full details and answers are below. Thanks to Jessica for responding and providing some open and honest answers. Jessica and Cliff profit over $100,000 a year selling on Amazon and they just updated their step-by-step video course to version 3.0. The new version contains the latest updated info, on exactly how to create a successful online business, selling products on Amazon. Can you describe your course for someone brand new to the idea of selling physical products on Amazon? Our Amazon Bootcamp 3.0 is a video based course that is made for sellers who prefer a step-by-step model over a general do it yourself method. We also include a members only private Facebook group for support which has replaced our forum. We have several high level sellers who are ready to assist new sellers, as they are starting their business. I recall your initial course was centered around sourcing products locally, prepping them, shipping them to Amazon and then Amazon fulfills the order through the FBA program. Do you also provide any details in the new course, about sourcing products through other means? In the new course, we have 3 hours worth of videos specific to online sourcing, which is the main sourcing focus in the new course. We also cover retail arbitrage and discount stores. Ultimately they are all very similar, just with different locations. If you could try and put yourself back in the shoes of someone brand new, having never sold anything on Amazon, knowing everything you know today, good and bad, what are some of the key things that you could tell someone, to give them the best chance of success right from the start? One is that there were no real courses out there. I spent so much time just doing my own research. Now, people have the opportunity to save all of that time by purchasing a course and can use that time to actually find products and make money right away. Instead of stumbling through the process. There were no scanning apps when I started. When they first became available I didn’t even flinch to pay like $40/month for it. I think it is very important for people to realize that with an Amazon FBA business, it really does take money to make money. You have to treat it like a business. Sometimes things make running your business easier, making them worth the money. Even if you don’t see a return right away because you have some extra expenses. When you do get going, you will be so much better off because you didn’t scrimp in every situation. Lastly, a big thing for me has always having a strong support system. In online business of any kind, it can get lonely. That is why we include a private Facebook group with our course. It keeps the community full of very like-minded people who have all done the same training. If you have been considering the idea of developing your own lifestyle business, selling on Amazon, Jessica’s course might be just what you’ve been looking for. It is the only true step-by-step Amazon video training course currently available. Be sure to take advantage of the opportunity provided through my link, to get the first three video lessons absolutely free. That is a great way to kick the tires and see if selling on Amazon is the right opportunity for you. The course also comes with a full, 60 day, no questions asked, money back guarantee. If you do decide to go through my affiliate link, I sincerely thank you ahead of time and as always, best wishes for continued success with all of your online adventures!